So iconic that it inspired a favorite Christmas carol, the silvertone bell has been a beloved holiday tradition for generations. 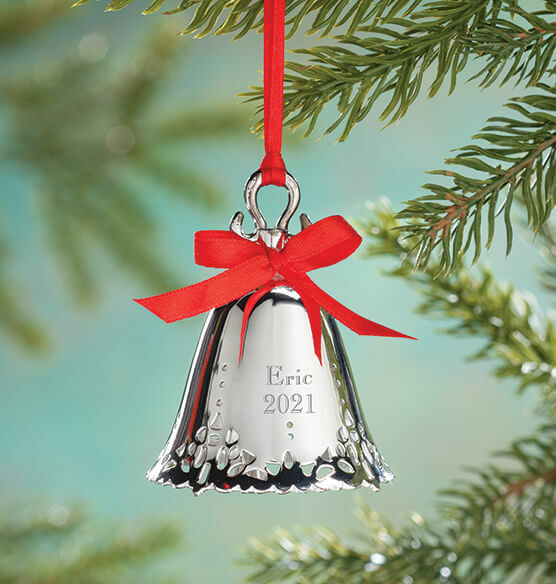 Our personalized silvertone bell ornament, with its festive jingle and shiny good looks, will be a highlight on your Christmas tree. Adults will enjoy its traditional style and nostalgic appeal, and children will likely beg to ring it. The engraved personalization commemorates a name and the year, making this a perfect gift idea. Nice gift for every one's tree. We gave one to each family member. I really liked these bell ornaments last year so this year I bought 10 with all different names. Everything came in looking perfect. I kept buying as I thought of friends who would like just last name and the date. Some I just put name. They are sold out of a few and I can understand why. I buy one every year they are used as a collection that I hang over my front door. I send my little grand nieces a bell each Christmas. For some, I've spent more than twice the cost of these bells, but none more charming. I have been giving these bells for many years to friends and family, starting with a new baby, some of whom are now married with children of their own. By the time they marry, they have over 20 bells to decorate their own tree. These are a Tradition in our Family and all the ornaments I get are for newest members of our family Blood family or not ! Love all the ornaments you sell ! I started the tradition of giving a silver bell to my children for St Nicholas day when they were married. At first it was easy to find resonably priced bells but as the years has passed it has become very difficult to find. I am always able to find them in your catalog and it has the year and we can also have their names engraved. Thanks for helping me continue that tradtion. I buy a bell every year I hang them over my front door. I think all three colors of these bells are lovely. This little bell ornament is a perfect gift for our granddaughter's first Christmas. I wanted something that would be a keepsake that's personallized with her name and her birth year. Yet, I didn't want something that's just for a baby. This bell is perfect, and I'm sure she will enjoy ringing it and hanging it on the tree for a long time to come. Very pretty and worth the cost. Pretty bells with names and birthdays on the Christmas tree bring back memories. I bought one for myself and 2 for xmas presents!! I love them! Great preasants I am sure they will be happy because I am truly happy and VERY satisfied!! For years I have chosen gifts for my daughter's Christmas tree, decorated with clear lights, silver, and white ornaments. I also am a bell collector, so this gift was personal as well as reflecting both my interests and my interior designer daughter's taste. I use my bell to hang over my front door. I've been giving these to my granddaughters for many years and they look forward to them every Christmas. IT IS A FAMILY TRADITION TO SHOP MILES FOR SILVER CHRISTMAS BELLS AT MILES KIMBALL . THIS WILL BE #50 ON MY TREE AND # 2O ON AT LEAST 3 OTHER TREES IN THE FAMILY! bell collection to hang on their trees to remember Granny after I am gone. This is a wonderful gift for any age. It is truly a keepsake! I love the product! I order 4 each year! I order one every year for each of my granddaughters. They truly love them. They are a gift to remember me by when I'm gone. IT HAS BECOME A FAMILY TRADITION! I give these bells to my children each year at Christmas. When they go out on their own, they will have a good start to decorating their own Christmas trees. I give these to the children each year from birth. When they get old enough to marry they have their first ornaments for their first tree. For years we have given Silver Bells, with the year engraved, for the holidays. We purchased bells produced by the International Silver Company. These apparently are no longer available. This is a very good substitute. Note that the engraving is not as prominent as in the picture. I felt good about giving this to my eldest daughter for her Christmas ornament last year. I give one of these to my granddaughter every year. This has been going on for 17 years now. She loves getting her special bell every Christmas. We ordered these to give to the families of our church members who have passed this year. The pastor will give them to the families during worship service on All Saints Day. They are really nice ornaments and we are very pleased. My mother bought a silver Christmas Bell ornament from you for my oldest son when he was born many years ago. Some years later when I was expecting my second son she passed away two weeks before he was born. I intended to get a silver bell ornament for him too but time goes by quickly and you just forget things. In December of this year he graduated from college! While putting away the holiday ornaments, I vowed to make it a top priority to get one for him no matter what the season or date. I did. It is not as thick nor as sturdy as the first bell but what a wonderful bell it is and it arrived on Valenine's Day! We shared it and the story and both of us were pleased. I am delighted with this bell . The only complaint about these is the engraving, it is very hard to see, don't really know what could be done to change this. Very pretty! I ordered 8 of these for Nieces and nephews. Very pretty. However 4 of the 8 I ordered did not have the bell ringers attached. It was too close to Christmas to send them back, so I had to take them to a jeweler to have them attached. I ordered a gold & silver bell. I got them for my Xmas tree. They look quality. Nothing 'tinny' about them. I gave them 4 stars instead of 5, because the red ribbon didn't quite do them justice. This bell is really cute, and definitely a good price for being engraved. The bell itself is really nice, but the engraved names and year are a little harder to see than I expected. The letters are thinner and you really have to look for the engraving to notice that its there. But overall, I think that its worth it. I hang them on the Christmas tree. I bought this bell as a gift for my secret pal at work. We love the song "Silver Bells" so this is perfect. I had Secret Santa and the year engraved on it. I think my "pal" will love this on her tree and think of me every year hereafter. This is a great gift for children. It can be repeated every year with the new year's date on it. If started at a young age the child could build quite a Christmas decoration collection by the time they are grown up. Easy for kids to remember who thought they were special enough to give them a personalized girt. The product is nice. I have a collection of bells. Each one has a different top or different base, which makes them unique. I have the year on all of them. I'd like to continue ordering the bells each year but if they are going to be identical each year, I'll have to find somewhere else to order them. I also buy one for my sisters and mom. It's a great collection. I hope you have a different design for next year. Also the engraving is too light. It's hardly readable. I've been buying ornaments of this type for my kids and grandkids for nearly 40 years, and have seen the quality diminish in that time -- not just at Miles Kimball, but overall. The metal is thin, therefore the engraving is shallow and small (font size) and barely legible. In addition, of the eight that I ordered, two of them came disassembled in their boxes, basically a box of parts. Fortunately, I opened all eight boxes to examine them, rather than wrapping them as received. However, I must say that the price was right for a retired couple living on fixed income, especially as compared to department store prices for similar "brand name" items (2x to 3x higher). Engraving is barely readable. Bell itself is nice. I bought over 21 of these bells with all of my family's names on them. It is a tradition, every year I buy ornaments for each member of my family. This year I saw these bells and I loved them. They are really beautiful bells! When I got them I just couldn't wait to open the box! When I saw them I could barely read the names on them! The engraving is so very light that I am almost embarrassed to hand them out. Maybe I should by magnifying glasses to hand out with them! What a shame, beautiful bells, really poor engraving. 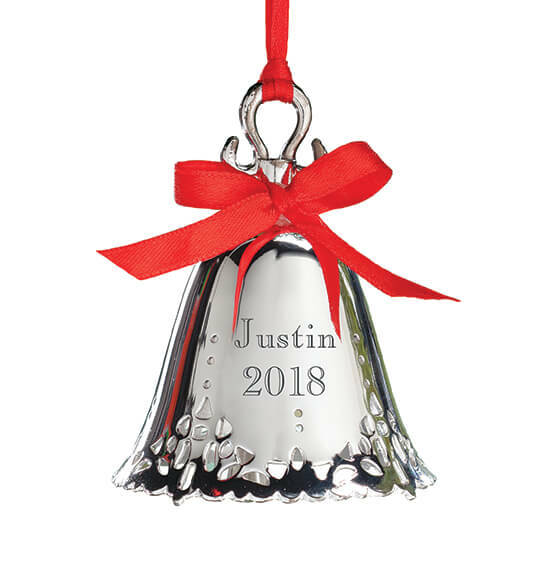 I purchased 5 of these bell ornaments to give as gifts. The bells are very pretty and have a nice ring tone. However, the engraving is so thin that you can't even see that it is there until you hold it in the light and turn it until the light hits it just right. The bell is smaller than I thought it would be and the engraving is not as deep as I thought it should be. It can be barely seen and I'm going to have to point out that it's a personalized bell when I give it as a gift. The engraving is so light that it is very difficult to see it and in a few years will be no longer visible. I have been purchasing these bells for the last 13 years as a gift for my granddaughter. I found the bells to be of poorer quality this year. The first one came broken and the etching was not deep enough. But, thank you for replacing it, my granddaughter now has her 2010 Christmas bell! Part of my order was not engraved, some of the items were defective, customer service was impossible to reach, either by phone or e-mail. was very attentive and apologetic, but it was way too late. I e-mailed customer service; they said they would respond, but never did. Newely married couple celebrating first married Christmas. I get one every year ! These are memory gifts from Grandmother to Grandchildren. In memory of a loved one who passed away this year. Because they're very pretty, and they'll be a wonderful keepsake for my children in years to come. My Mom gave me one similar when I was a kid. I got them for my kids. Great price. New baby, first Christmas. We give silver Christmas bells to this family every year. My son likes bell Christmas tree ornaments and this looked attractive. They looked good and personalization was easy. I liked the look of the product. Appears to be good quality. We buy an ornament every year for our grandchildren and now that they are getting older, this bell is very nice and suited to all ages. Because Things Remembered stopped carrying Christmas Bells. It's a tradition we do with biggest event each year and we were not able to get it done this year. new grandchild. My grandmother gave them to me, I still have them. Yesterday I had to put down my Husky and little girl of nine years due to cancer. I give my son a silver bell every year for Christmas. Our tradition. your website was user friendly and great price. My name is not Paul. Why does this say Paul? Reminds me of a custom ornament that I received as a child. because i wanted an personalized ornament for year of 1989.
this is the classiest looking silver ornament I could find on line that could be engraved. My mother-in-law has purchased one every year for my wife and I for as long as we have been married. She did this for herself and her husband and have over 40 bells on her tree ever year. I purchased this to continue the tradition she started for my wife and I because she is no longer with us and will be deeply missed. Price and design. Nice to personalize. Metal so will not break . Is this a ringing bell ? BEST ANSWER: Thank you for your question. The Silver plated bell ornament does ring. We hope this information will be of help to you. How many characters can I engrave? Is the back engraveable? BEST ANSWER: Thank you for your question. 15 characters can be engraved on the first line and 4 for the second. We hope this information will be of help to you. Can you put any birth year on it? BEST ANSWER: Thank you for your question. You can put any year you would like on the ornament. We hope this information will be of help to you. WHAT SIZE IS THE BELL ? BEST ANSWER: Thank you for your question. The bell is 2" high. We hope this information will be of help to you. I was wondering if you sell these bells without the year on them? I have a bell collection and I am missing a few year and I would like to fill in the missing years. BEST ANSWER: Thank you for your question. You can put any year needed on the bell. It does not need to be the current year. We hope this information will be of help to you.